I went into this year’s North Face 50 miler in Park City, Utah wanting to improve on my performance from last year where I finished 3rd in 7:45:46. I felt fitter, stronger and faster this year. The day turned out to be very interesting to say the least. I woke up at 3 am to allow my breakfast to digest before the 5 am start. I ate a 32 oz smoothie with bananas, berries, chia seeds, fresh turmeric and ginger. This is my go to pre-race meal that works really well for me. I started out the race in the lead with a group of about 8 of us. I actually don’t like leading but I think I did because I know the course well. The first two hours of the race would be in the dark which I love. 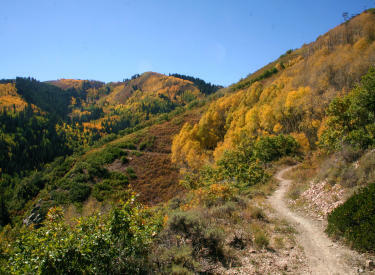 The golden aspen leaves covering the trail glowed under our headlamps. Almost right from the start, I felt like something was off. To say I felt tired is not quite accurate. But I knew a 50 miler is a long way to go and things change all the time. I’ve raced over 35 ultra marathons and from my experience, you go through major ups and downs so this was expected. However, this lingering feeling of being off persisted. The two weeks before the race I made a rookie mistake of doing something different than normal. As a coach, I know this could be disastrous but I didn’t think it would be a big deal. I was doing manual labor and landscaping which included swinging a heavy pick, carrying heavy loads and digging holes for much of the days. I love this kind of work but right before a race, it was a big mistake. My entire upper body and back during the race was extremely tired. This forced me to run in a way that wasn’t normal for me and quite inefficient especially on the uphills. I had to bend and hunch over on any uphill which really slowed me down considering they are usually my specialty. After the first 12 miles, we climbed almost 3000 feet and I kept pushing on. I started to really struggle especially on the uphills where I noticed that I was power hiking hills where normally I would be running especially so early in the race. My upper body was cooked. I was in anywhere from 7th to 5th place by mile 16. It was then that I started have persistent thoughts of quitting and giving up. These thoughts are normal during an ultra and everyone from elite to beginner has these thoughts during a race. However, it’s all I could think about. If I just stopped, the discomfort would go away. The darkness and pain I was experiencing was my choice. All I had to do was stop, it was that easy. But I have never DNF’d (did not finish) a race before and I was having thoughts of shame, guilt and let down if I DNF’d. But I continued to put one foot in front of the other. Walk the uphills, cruise the flats and downhills. I finally reached Lindsey and mile 32 and I was determined to quit. That was just a fact. But when I saw her, something switched. I got excited or something, I just couldn’t quit. It just wasn’t an option when I saw her. I am so thankful that she was there. I continued on and almost immediately after leaving I was surrounded by those dark thoughts of quitting again. I didn’t have to suffer like I was. It was now over 6 hours and I continued to suffer and want to quit. Because I raced this event last year, I knew there was a really long final uphill around mile 41. I was dreading it! It’s all I could think about. And when I got to it, I just put one foot in front of the other and went up. At this point, I got into 4th place passing a few runners. I really wanted to get onto the podium and catch 3rd place. With less than 10 miles to go, I heard he had over 17 minutes on me. I’m generally a positive runner and think anything is possible. To give anything less than my best (for that particular day and moment) is not acceptable. So even though it hurt so bad, I tried. I had to. But the suffering increased as I tried to catch 3rd. Again, I didn’t have to do this and I wanted to quit. But something in me (stubbornness?) made me continue. The last 5 miles or so is a downhill so I decided to give it all I had and bomb down it. I ended up making up about 7 minutes on 3rd place but did not catch him. I finished in 8:03:25 in 4th place. As much as I was disappointed with my time and performance, I was thrilled to be finished and really proud of myself for not giving up. This was mentally one of the most challenging races for me (more so than most 100 milers). I learned so much from this race about myself and what the mind and body are capable of. Congrats to all the runners and a huge thanks to all the volunteers, spectators and directors for helping out. We couldn’t do it without you! 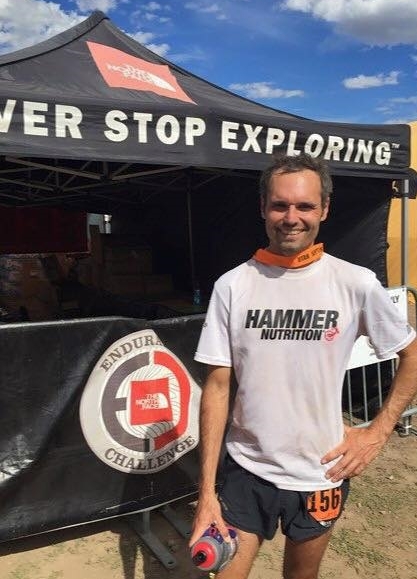 This entry was posted in online running coach and tagged Damian, marathon, north face, park city, race, run, salt lake city, Stoy, ultra by Wholistic Running. Bookmark the permalink.